Olympus on Tuesday added a new member to its Tough series of rugged, outdoor camera gear that could pose a serious threat to other action cameras. The pocket-sized Stylus Tough TG-Tracker (the name could use some work) is waterproof to a depth of 100 feet, crushproof up to 220 pounds, shockproof from a height of seven feet, freezeproof down to 14°F (-10°C) and dustproof – all without a protective casing. The camera also features a wealth of sensors including GPS, a barometric pressure sensor, temperature sensor, an eCompass and accelerometer. It also has built-in 802.11 b/g/n Wi-Fi, an LED headlight, a 1.5-inch, 90-degree tilt-out display and a five-axis electronic stabilization system. Also bundled with each purchase is a camera grip to help with stabilization while shooting hand-held. As for the actual optics, buyers will receive a 204-degree wide-angle f/2.0 lens that’s capable of recording video at up to 4K quality at 30 frames per second. Optionally, you can shoot at 1080p (up to 60fps), 720p (up to 240fps) and lower-quality settings should the need arise. Battery life is rated at 95 minutes of continuous 4K shooting. Olympus’ latest can also be used to capture still images although it’s not nearly as impressive, limited to just 8-megapixel photos in 16:9 format. 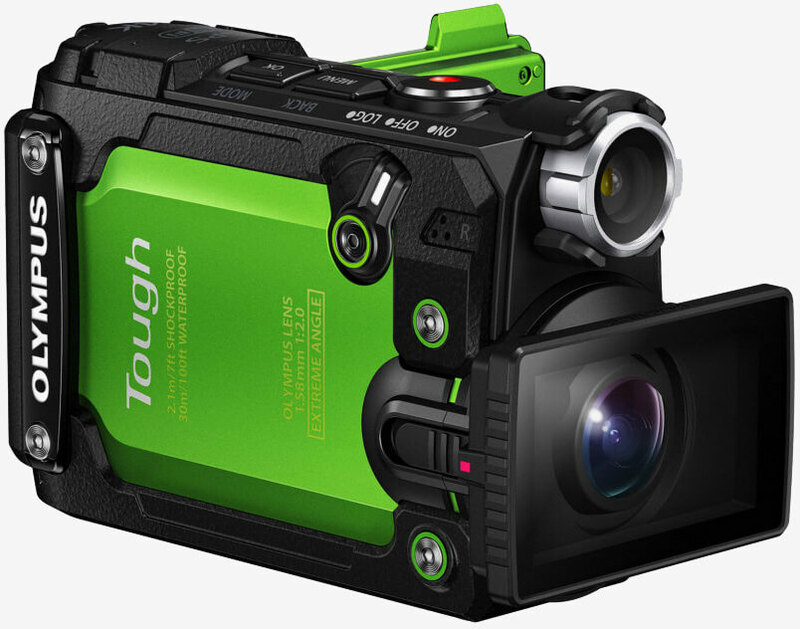 The Olympus Stylus Tough TG-Tracker will be available in green and black beginning next month with an estimated street price of $349.99 in the US ($479.99 in Canada).